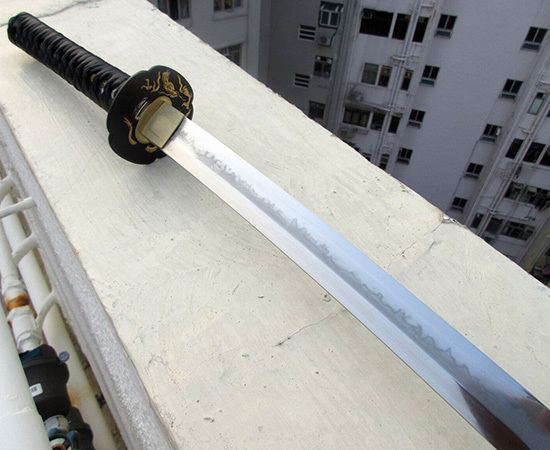 Some traditionalists and elitists argue that monotempered sword are not authentic Katana at all (indeed, quite a few purists argue that unless a Katana is made in Japan and costs upwards of several thousand dollars, it is not authentic). 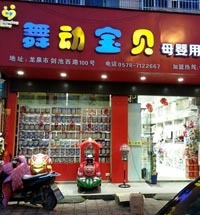 However, in the dojo or the backyard, they can certainly cut the same way.. 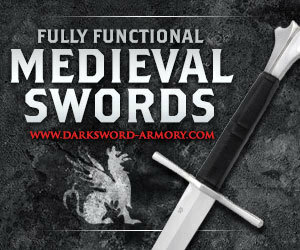 It is hand made and hand forged - made from a suitable sword steel and properly tempered. It has a full tang under the hood - a proper nakago. It handles and cuts almost the same as the historical originals did - and is at least as strong (actually, most swords made these days are actually STRONGER!).. 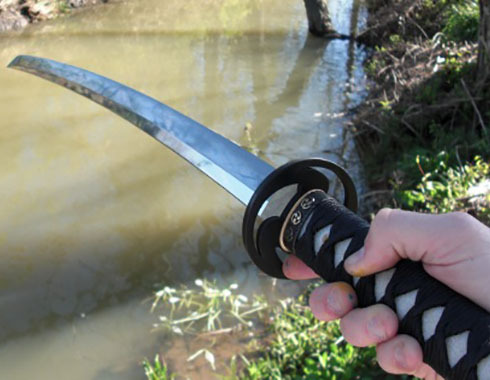 So let's look at the two main types of functional Japanese style swords currently on the market and then narrow it down to one Katana of each type that we feel offer the best value for money below the $300 price point. Differences between the two main types of authentic Katana in a nutshell.. There are basically two factors that separate the two main types of authentic Katana currently on the market. how it is tempered and hardened..
A traditional sword has been differentially hardened - that is to say that the edge of the sword is much harder than the spine, and this is done by applying a special clay treatment and quenching the blade so that the spine cools much slower than the edge. The easiest way to identify if a sword has been differentially hardened is to look at the hamon - if the hamon is real,then the blade is much harder at the edge. The second type of sword is the contemporary one that has been monotempered - i.e. 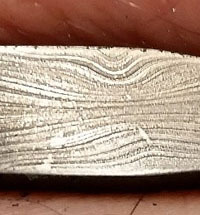 it was not clayed or differentially hardened but it is the same level of hardness all the way through (monotempered or through hardened). 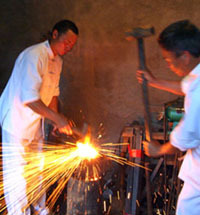 True enough,there are sub types - such as swords that have been folded and swords that have been laminated, but the main point of differentiation is the hamon (after all, folding does nothing to improve the quality of a blade made from modern crucible steel, and a laminated blade is usually also differentially hardened, with the end result of lamination is the same as differential hardening - to make the edge harder and the spine softer). 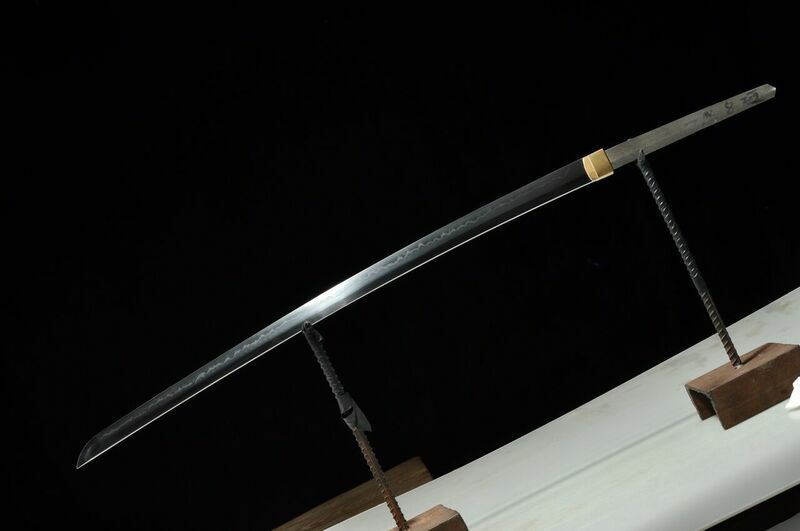 Most serious collectors of Japanese swords have at least one of each broad type of Katana in their collection. But many prefer one style over the other - so here is a quick and dirty guide to the advantages and disadvantages of each type so you can figure out where you should be focusing your search. "Traditional Blades Cut With Minimal Effort while Contemporary Katana have an emphasis on toughness and durability"
The hardened edge of a traditional Katana simply cuts better for the simple reason that the harder the steel is, the easier it pushes aside anything softer than it (especially organic targets such as pork legs, tatami mats, bamboo etc - authentic Katana were specialized to cut targets that approximate human flesh and bone). You can feel the difference, a Katana with a hardened edge kind of 'snips' through a target with minimal resistance, while a sword that is monotempered generally requires more muscle and force to go through the same target, and you can feel the extra resistance when you cut. 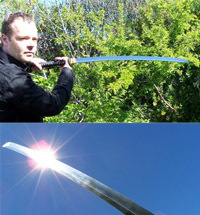 Conversely, a monotempered Katana can be used on a wider variety of targets because the edge is softer and more shock resistant - and because the edge and spine are the same hardness, will spring back to true when deformed or bent much like a medieval European sword, while a differentially hardened Katana will tend to stay bent..
You can see this demonstrated rather graphically in the video below.The first part of the video shows a monotempered 1060 carbon steel blade being belted against a steel pole with zero damage.While a blade made of tougher,harder 5160 that has been differentially hardened gets the edge chewed up by the same target..
And then it gets extreme - testing on a granite block and well.. The results speak for themselves.. (after all, even the best authentic Katana made in Japan will quickly meet its fate if pitted against granite!). VIDEO: Breaking Swords so YOU don't have to..
Because of the extra durability of monotempered Katana, they are often recommended for beginners who may attempt to cut targets that even the best authentic Katana is not optimized for, and are more forgiving of bad technique. However, just because they are not as tough does not mean that one should discount traditional blades..
Because when used on a target meant to approximate human flesh and bone, a traditional Katana simply cuts so much easier with minimal effort - it can be sharpened to a higher level than a monotempered blade (and keep that edge for much longer) and is,quite simply,the most authentic Katana of the two options. Plus, a nicely done hamon temper line is true sword art at its finest. 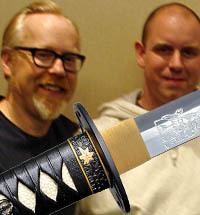 So if you have come this far, you should already have an idea of which of the two types of authentic Katana that you like the most is: if you like a cosmetically appealing blade that cuts targets with ease and is as close as possible to a genuine Nihonto costing several thousand dollars - then a traditional sword is for you. If on the other hand you want a blade that can handle a wider variety of (sometimes unintentional) targets - then you should invest in a monotempered beater style blade. 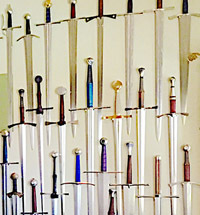 Within each category,there are MANY swords to choose from - and it can be especially confusing for the beginner. So let's make it easy - and select what I feel are the best buys for each category for under $300. When it comes to traditional blades under $300, my personal choice is the Ryujin Custom Katana line..
One of the bare blades, ready to be mounted in your choice of fittings.. 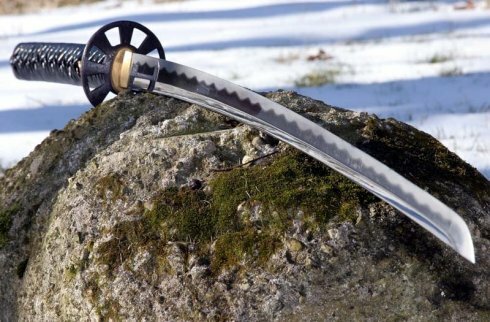 Starting at just $229.99 for a differentially hardened blade made from T10 tool steel, my personal favorite steel type for a traditional style blade, these swords are extremely competitively priced and have one additional perk - you can customize the blade type,choice of tsuba, choice of handle wrap color and choice of saya (sheathe) color all at no additional cost and all assembled in California and shipped out within one week of ordering! The concept was revolutionary - import the bare blades and katana parts and assemble them to the customers preference within a week! 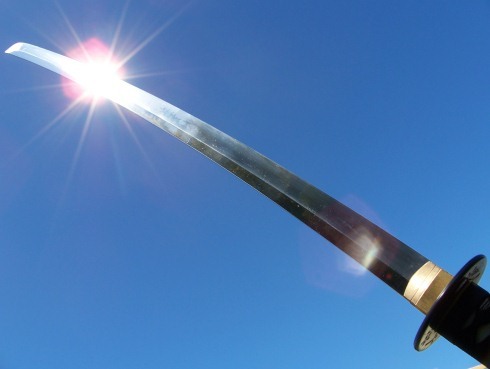 It is a lot less complicated to make a monotempered sword - no claying, greater chance of surviving the heat quench and tempering - and so there are quite a few cheap options.. 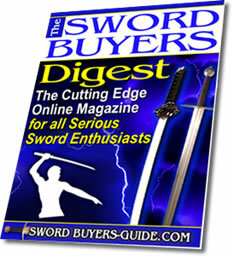 But if you want to get serious, our top recommended swords under $300 have to be those from Ronin Katana. It is not just the blade that makes these swords so good - for overall,the materials used in the rest of the swords construction are head and shoulders above ANYTHING else under $300, making them the all round best value for money package..
One of a series of 31 models - all with heavy duty, no-nonsense mono-tempered 1060 carbon steel blades and the best fittings available at swords in this price point. At the end of the day, which of the two main types of Katana available these days - traditional or beater - depends on your personal preference. Some people,like myself,can appreciate both types.I like a traditional blade for how effortlessly it cuts light and standard targets, but I also enjoy the cool factor of a 'take on anything' beater. 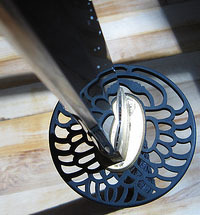 Some dojos prefer to supply their students with monotempered beaters simply because they are so forgiving of mistakes, bad techniques and unintentional targets (stands, brick walls, concrete floors, etc) while others prefer the students learn the hard way and may need them to straighten out a traditional blade that took a set on a badly aligned cut. 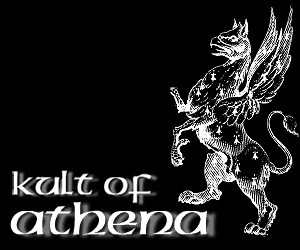 There is no right or wrong answer - just what you prefer. And there are plenty of options for both.. 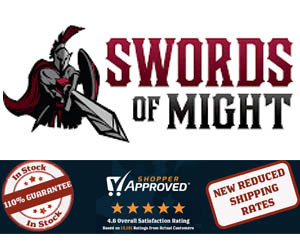 NEED MORE SWORDS AND MORE REVIEWS? No Problem! 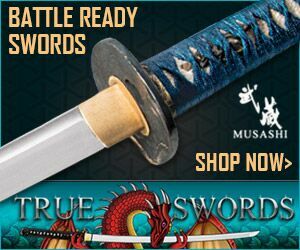 For most beginning sword collectors, a sub $300 sword will definitely cut the mustard and can fulfill all of our starting requirements of the definition of an authentic Katana. 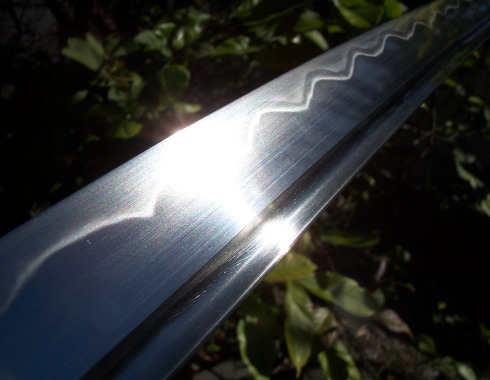 But for those more discerning collectors who want to get as close as possible to a Japanese made Nihonto,at 1/5th or less of the price tag, we have a range of swords made by certified master smiths from the famous sword making city of Longquan, Forge Direct.. 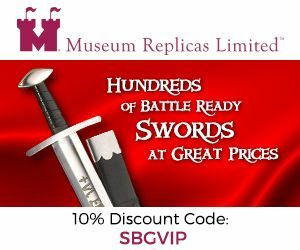 These swords are as traditional as they come, are perfectly balanced, cut like light sabers and are fully customizable - check out the review below to see what all the fuss is about..